Joyce Blonskij – Certified Income Specialist provides the knowledge needed to create a plan designated to provide a steady stream of income to clients on a regular basis, using conventional as well as unconventional methods. To obtain this designation the following requirements must be met: 2,000 hours or more work experience in the financial services industry or a bachelor’s degree for an accredited college or university. Candidate must complete a self-study program of six modules in 15 weeks. Securities offered through Cambridge Investment Research, Inc., a Broker/Dealer, Member FINRA/SIPC, to residents of: AL, AZ, CA, CO, NV, WA, MD. Investment Advisor Representative, Cambridge Investment Research Advisors, Inc., a Registered Investment Advisor. This material does not constitute an offer to sell or a solicitation of an offer to buy any security. An offer can only be made by a prospectus that contains more complete information on risks, management fees and other expenses. There is no guarantee that any real estate strategy will be successful. Investment in REITs involves risks including but not limited to: no secondary market; limitation on liquidity, transfer and redemption of shares; distributions made may not come from income and can be deemed a return of capital; a REIT may lack property diversification; a REIT is dependent upon its advisor to select investments and conduct operations; and a REIT’s advisor will face conflicts of interest. Past performance does not guarantee future results. Investments are not bank guaranteed, not FDIC insured and may lose value. Securities and advisory services offered through Packerland Brokerage Services, Inc., an unaffiliated entity. REITs may not be suitable for all investors. The value of a REIT may be worth more or less than its original cost, investors may have difficulty selling shares, REITs involve risks associated with an investment in real estate such as market risk, interest rate risk, operating expenses, insurance costs, tenant turnover and credit risk, and there are significant fees and charges inherent in investing in REITs. Information contained in this communication is not considered an official record of your account and does not supersede normal trade confirmations or statements, as applicable. Any information provided has been prepared from sources believed to be reliable but is not guaranteed, does not represent all available data necessary for making investment decisions and is for informational purposes only. This e-mail may be privileged and/or confidential, and the sender does not waive any related rights and obligations. Any distribution, use or copying of this e-mail or the information it contains by other than an intended recipient is unauthorized. If you receive this e-mail in error, please advise me (by return e-mail or otherwise) immediately. This email message is intended for the sole use of the addressee and may contain confidential information. If you are not the intended recipient or otherwise authorized to view such information, you are hereby notified that viewing such information, as well as any disclosure, copying, distribution or use of any of the information contained in or attached therein is strictly prohibited. If you received this email in error, please reply to the sender and delete the original message. We may retain and reproduce any email for federal, state, or other regulatory agencies as required by applicable law. Email transmissions cannot be guaranteed to be secure or error-free as information could be intercepted, corrupted, lost, destroyed, arrive late, incomplete, or contain viruses. If your communication contains sensitive information (including but not limited to Social Security number, driver’s license number, state issued identification card number, financial account number, credit or debit card number), it is recommended that you provide it via secure mail. The information transmitted is intended only for the person or entity to which it is addressed and may contain confidential and/or privileged material. Any review, retransmission, dissemination or other use of, or taking of any action in reliance upon, this information by persons or entities other than the intended recipient is prohibited. If you received this in error, please contact the sender and delete the material from any computer. Email management, archiving & monitoring technology powered by Smarsh, Inc.
President of Blonskij Financial Services (founded in 2003) Joyce Blonskij presents Own the Clouds, a no-nonsense guide to investing in Cloud computing companies – that is, companies which provide resources and technological advantages for the Internet and wireless devices. Written to be comprehensible (complete with definitions of common Cloud techno-speak) to investors of all backgrounds – even those new to the digital age! – Own the Clouds outlines how to evaluate whether a Cloud company is viable, how to track one’s investments, how to avoid common pitfalls, and even the charitable side of Cloud companies. “Please remember, investing is NOT ‘one-size-fits-all.’ If you do decide to buy a subscription to a newsletter on investing, keep in mind you’re unique and the company or organization producing the newsletter may be selling a cookie-cutter investment idea that is not tailored to you. Use it as a tool, not a crutch.” Own the Clouds is an absolute “must-have” for anyone considering putting their money to work in these fast-growing technology stocks of the future. Highly recommended. Securities offered through Cambridge Investment Research, Inc., a Broker/Dealer, Member FINRA/SIPC. Investment Advisor Representative Cambridge Investment Research Advisors, Inc., a Registered Investment Advisor. Cambridge and Blonskij Financial Services Inc., Own the Clouds, and DB Pension, are not affiliated. Charts show a course change ahead. Are stocks going higher? Check out the Smart Money. REVEALING DATA: The relationship between equities yeilds VS. the USA 10-year bond yeilds. Looking all the way back to 1871, the relationship between the USA 10-Year Bond Maturity Yields, and the S&P 500 Monthly Dividend Yields, has been an indicator of just where the stock market was headed. As an investor you need to know… these charts have made a course change. Find out what this could mean to you, and your money. This short “Smart Money” video aired Sept 10, 2012 on CNBC tells the story. The question you need to be asking is: Where do you invest for tomorrow? Click on the link below, to see what this means for you: Checking Out the Smart Money. We recommend, that before you invest funds to seek out the advise of a competent investment professional. Securities offered through Cambridge Investment Research, Inc., a Broker/Dealer, Member FINRA/SIPC. Investment Advisor Representative Cambridge Investment Research Advisors, Inc., a Registered Investment Advisor. Cambridge and Blonskij Financial Services Inc., are not affiliated. This timely interview discusses the energy sector of the market, and specifically the future of global oil, and the price of gasoline that we will be paying at the pump. With peak oil production topping out in 2005, and the age of Saudi Arabian and the Mexican oil fields, the question on everyone’s mind is: As consumers, what’s going happen to gasoline prices down the road? How can investors position their portfolios to take advantage of rising prices? How is “the cloud” playing a part of the energy story that’s unfolding? Listen and find out, as Joyce Blonskij interviews, Mr. Joseph Meyer, author of the highly sought after newsletter: Straight Money Analysis. via Future of Gas & Oil Prices, Joseph Meyer Interview. Offer Expires midnight tonight get over $1,700 in a Life Balance Gift Basket with the purchase of: “Hand Me A Wrench, My Life is Out of Whack” by Laura Hansen. You will want to jump on this NOW. My friend and fellow author, Laura Hansen is offering a $1,700+ Life Balance Gift Basket with the purchase of her book (which I’ve read and love). TODAY is the ONLY day this will be offered. Including an excerpt of Own the Clouds, she’s included free video, audio and live coaching along with really great offerings from over 20 of her colleagues – best-selling authors, international speakers and coaches, and master healers. Don’t wait. Get this now and collect all your wonderful gifts. 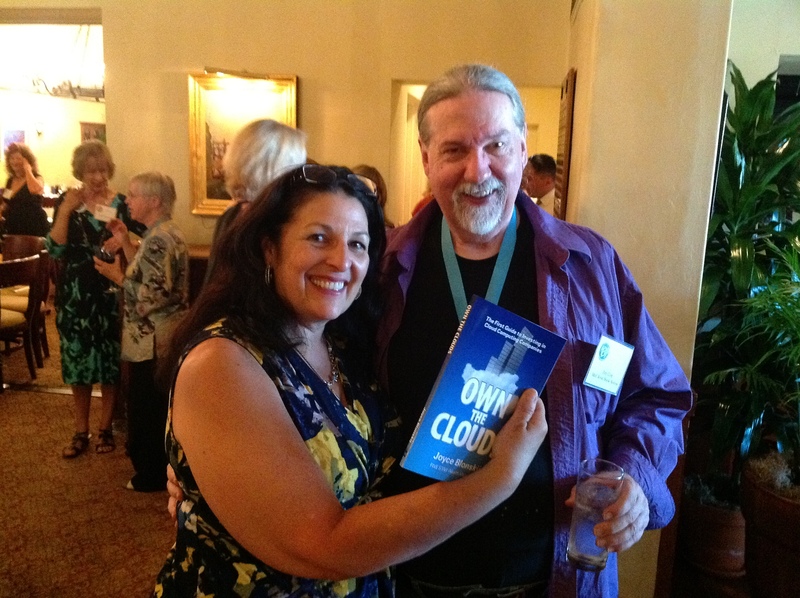 Great Gift for Dad for Father’s Day, Own the Clouds eBook! Joyce Blonskij shares insights everyone who has investments should know. A Different Way to See the Market. There is always an opportunity, if you know where to look.